These glasses use the natural refraction of water to create a cross-eyed viewer for 3D! They are adjustable and work for cross-eyed 3d images (some are included in the package). This is a fun viewer sure to increase children's interest in 3D and to help them understand refraction, similar to seeing a straw change direction when looking at a glass of drinking water. If you currently have 3D images use the free program stereo photo maker to convert them into crosseyed for use with this viewer! An excellent companion book for this viewer is Barry Rothstein's Crossview 3D which has images already printed in this format. Unplug cap to fill with water. Replace plug firmly. For best results, use bottled or distilled water as bubbles may form (which will disappear in 1 or 2 days). Unfold packaging to view 3-D sample images. Put glasses on and hold images approximately 15 inches away. 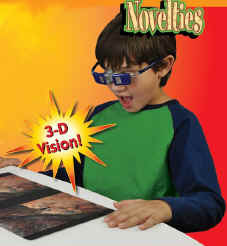 If viewing properly, you will now experience a 3-D image! If you aren't seeing the images clearly, you can adjust the sliding frames to optimize your view. It's best to start with them inwards and adjust outwards as needed. Use your tablet, laptop, home computer screen, or flat-screen TV for viewing crossed-format side-by-side 3-D images. 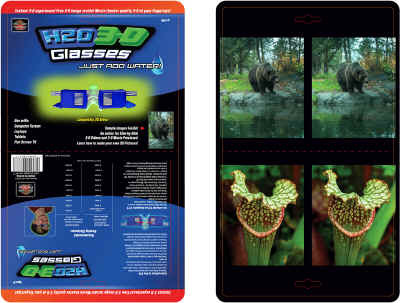 Look for fun 3-D images, videos and more at h2o3d.com and see instructions how to take 3-D 3D images at home! Search your favorite internet video website or search-engine, such as Youtube.com and search using keywords: "Side by Side 3D" and/or "Cross-eye 3D" (Although with the glasses you do not cross your eyes to see 3-D).